One goal in my reading experience is to find good faith-based fiction that I can recommend to others. I think the objective of the Christian author is a meaningful one, but as someone who has dabbled in fiction writing myself, I know that creating non-stereotypical characters with which readers in all walks of life can identify is a unique challenge in itself. 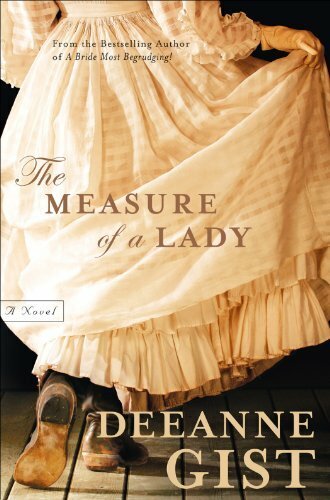 Christian author Deeanne Gist does a fine job meeting this challenge, and out of her seven quality novels that I’ve read, The Measure of a Lady stands out as her best work. I can’t help but to compare The Measure of a Lady to Redeeming Love (reviewed two weeks ago); the setting is 19th century San Francisco, during the California gold rush decadence; the protagonist is a headstrong, young single woman, trying to navigate romantic and family relationships; and at the center of the story is a message of God’s love and forgiveness that extends to all. However, The Measure of a Lady is decidedly better, offering an original and applicable story, relatable, realistic, and more nuanced characters, a snappier and more absorbing pace, and simply higher quality story-telling. One of the central conflicts of the novel is an important and enduring one: how to function as a Christian in a world that embraces things not of Christ. Gist’s main character, Rachel, is faithful to her values, but she has much to learn about showing love and kindness to those who are not exactly living as the Bible teaches. Rachel serves as the central moral voice, attempting to uphold virtue in a town filled with vice, but as she slowly learns, she is going about it in all the wrong ways. Instead of viewing others through a lens lacking judgement and criticism, she instead will not interact with the many prostitutes and gamblers of San Francisco. She believes that blatantly freezing out this non-Christian population is what her belief system requires of her, and of course, she will learn that this is the very opposite of what Scripture says. A major step in Rachel’s development comes when her sister, Lissa, falls into prostitution, causing Rachel to reevaluate her faith and, as a result, come into a much deeper and more mature understanding of true Christianity. Christian fiction does not have to be sappy and only meant for a Christian audience; if that is the case, I do not think it’s doing its job to the fullest. I appreciate Christian authors that realize their books can be far more effective if they are inclusive of a wider audience, and Gist gets a lot of things right here. Rachel hears God’s voice primarily through her reading of Scripture passages, which is typically more relatable and meaningful than an audible, booming voice that comes at the perfect time (like we tend to see in other works of Christian fiction). Rachel deals with her own flaws, temptations, and sins; she is not a perfect character, and her alternating struggles and triumphs add an element of encouragement and identification to the reader and realism to the novel. Gist identifies herself as an “inspirational romance writer,” a cheesy label that kind of makes me grimace (and don’t worry: the romance here between Rachel and bar-owner Johnnie is not overdone and thankfully does not induce much eye-rolling; it’s in fact developed in a grounded and effective way). Gist may use this label because she wants to reach a larger audience, including readers that might immediately skip over her novel if they see it is Christian fiction. If this is the case, I applaud her, because her novel has the potential to speak to all types of readers with its endearing characters, exciting plot (seriously, during the last half of the novel, just try to put it down! ), memorable and exhilarating climax, and very meaningful, Scripture-centered message. I would definitely keep The Measure of a Lady on my bookshelf for another several reads, but this is one that tends to get loaned out again and again! For more on Gist’s writing and point of view (which is similar to my own when it comes to Christian lit), check out this interesting link.